PASSion Award for me – and a little question for you! 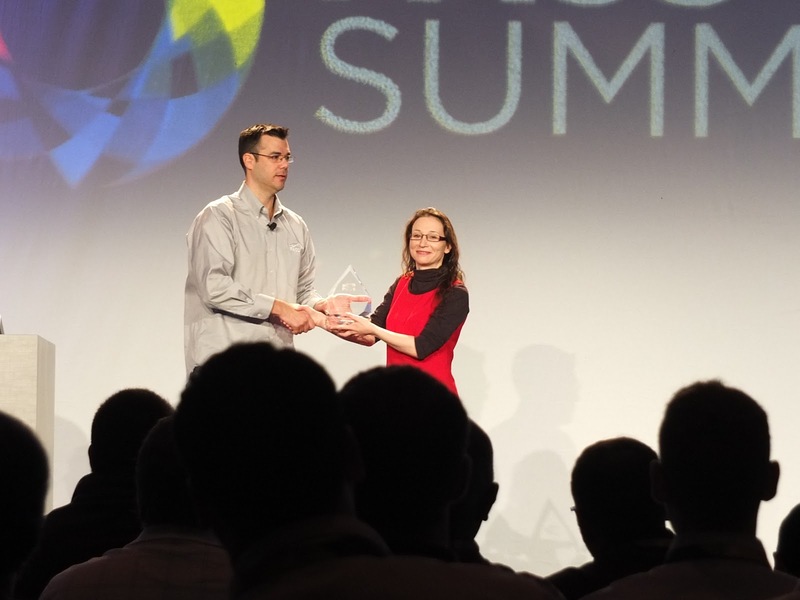 I’m the small one on the right 🙂 The Award was presented to me at SQLPass Summit 2012 by Thomas LaRock, who you might know better as SQLRockStar. I have been overwhelmed by everyone’s kindness towards me, and I want to say ‘thank you’ to SQLPass for presenting me with this Award. I was stunned to receive it, and I still cannot quite believe it. I want to say ‘Thank You’ to the SQLFamily community who congratulated me over Twitter at JenStirrup, or in person at SQLPass Summit. To everyone who sent a good wish my way: I am extremely grateful, and ‘thank you’ goes to you. Every tweet or ‘hey, congrats!’ was much appreciated, and I am humbled and touched by your kindness. It’s one of these things where people don’t realise what an impact they’ve had on me, and even the simplest ‘hey, congrats!’ has made me feel overwhelmed. Sometimes folks ask me ‘what do you get out of helping the community?’ To me, this is the wrong question. I don’t do it to get anything out of it. You’ll find a lot of volunteers will say that, too. So why do something, if you don’t intend to get anything from it? The truth is, I’ve met so many great friends and smart SQL / Business Intelligence people from my connections to PASS, it’s my pleasure to help and to be involved with the community. Being involved is a good thing in itself. I have met some of my deepest and greatest friends in the SQL Server community via PASS, and this has been life-changing for me. If you’re wondering whether you should take the plunge and become involved – even as an active member, turning up to meetings – I’d definitely encourage it. I know that myself and other SQLFamily members will tell you that the community has kept them strong when times are hard. I’ve certainly been personally buoyed by the kind hearts in the community, a lot of whom make the days and nights brighter without even realising it. I’m looking forward to 2013, with all the fun that PASS activities will bring. Let’s push forward and bring the sqlfamily to more folks across Europe, India and Africa, and reach out to ‘newbies’ in the US. Everyone has to start learning somewhere, and I’m not ashamed to say that I will never stop learning. You’ll touch lives – the PASS and SQLBits communities have certain touched mine. In particular, we can welcome people from different backgrounds into the community. Sitting over here in London, we talk a lot about diversity in one of the most proudly diverse, yet welcoming, places in the planet. Diversity brings inspiration and ideas from different perspectives and places and this is why the Women in Technology movement, in particular, is important to the community. We can learn from each other, and to do this better, it can mean that we understand each other better. The Women in Technology debates can foster discussion. I tend to find that the WIT events are attended by the nicest, nicest people since they care, and they’ve voted to learn more about different perspectives by turning up to the event. We don’t have all the answers, but the amazing insights from audience members really bring it home that we have so many smart men and women in our community. Curious? Here’s a little question for you: Why don’t you to along to the next WIT event at your local SQLSaturday, and see what the fuss is about? You’ll be surprised by the insights and interesting discussions you’ll find. Try it, and blog! If you don’t blog, why don’t you email me at JenStirrup[at]copperblueconsulting[dot]com and I would love to hear from you! Thank you to all at SQLPass for giving me such a special day, and I will never forget it. This entry was posted in SQLPASS, WIT. Bookmark the permalink.